Marco lecturer Lauren Whitnah received the 2018 Southeastern Medieval Association’s (SEMA) Award for Teaching Excellence in recognition of her outstanding skills in the classroom and beyond. Known for her tremendous energy and approachability, each year Whitnah works with approximately 400 students who enroll in Marco’s two-semester introduction to Medieval and Renaissance Studies course. Despite the size of the classes she teaches, Whitnah gets to know her students well. Indeed, she has the uncanny ability to make a large lecture hall feel like a seminar room. She tirelessly meets with students outside of class to discuss history, sources, writing styles, or any number of other topics. 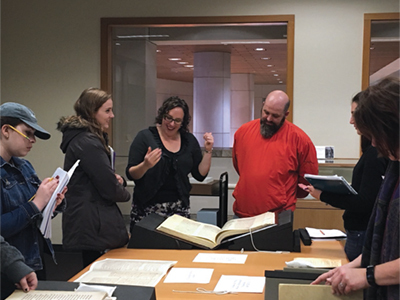 And she makes effective use of the special collections in Hodges Library, introducing her students to medieval manuscripts so that they can begin to understand the winding historical roads their readings traveled before arriving in her classroom. “These diverse forms of student engagement, together with a variety of visual and textual sources to discuss, make her a uniquely effective teacher,” said Jason Stubblefield, doctoral student in history who has worked for two years as Whitnah’s assistant.